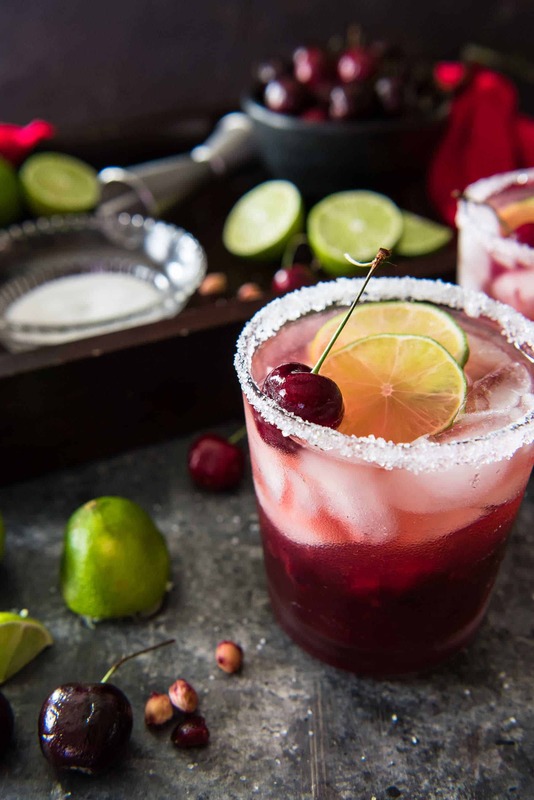 Take advantage of cherry season & enjoy a Fresh Cherry Margarita or two! 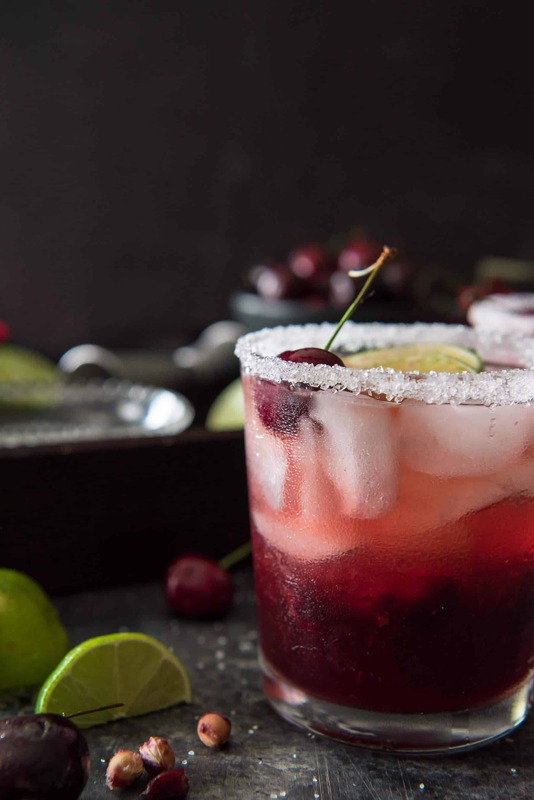 Fresh cherries turn your ordinary cocktail into something extra special for summer! More booze! More summer cocktails! Even more reasons to sit by the pool! Which isn’t something I do a lot of, since I’m definitely a distant cousin of Casper. But drinks like this make me want to sit back, soak up the sun, and think about stuff. JUST TAKE ME TO THE FRESH CHERRY MARGARITAS ALREADY! 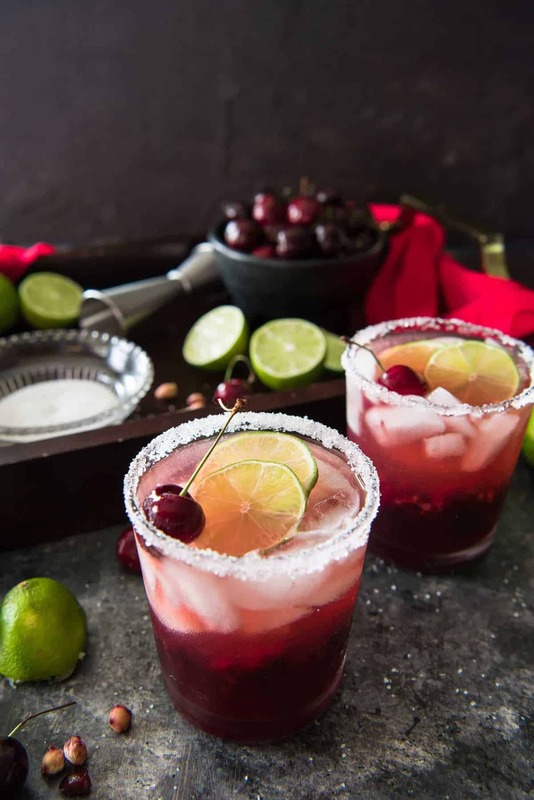 If you’d rather skip my (pretty darn helpful) tips and tricks, essential cooking info, and similar recipe ideas – and get straight to this deliciously easy cherry margarita recipe, just scroll right on down to the bottom of the page where you can find the printable recipe card! I would liken the past few months of my life to what some might call a roller coaster. Well, let’s say they were at least the part of the roller coaster that does a bunch of crazy flips and barrel rolls, and leaves your stomach a few hundred yards back while you continue to hurtle forward. My stomach still hasn’t found it’s way back to my body, yet. I have always been a firm believer than everything happens for a reason. My college career came to an abrupt halt when my Nana passed away 12 years ago. I suddenly had way more bills to pay and a house to upkeep, so going full-time at work was a necessity. My college boyfriend and I broke up less than a year after that, which sent me into an emotional tailspin. In the meantime, I had met the man who would become my husband…but I had no idea at the time. Day in and day out, life was steady. Comfortable. Safe. I was blessed with a rent & mortgage-free home to live in, a supportive man by my side, and close friends to spend time with. I had a job that I knew wasn’t going anywhere – one that presented unlimited opportunity to advance. I spent 17 years with a company because it was steady, comfortable, and safe. In spite of the fact that it wasn’t what I wanted to be doing. For a long time after I quit college, I had no idea what I did want to do. I had never really narrowed down my career goals anyway, but in the meantime, I was content to stay where I was. And then, I woke up one day and realized that being content wasn’t enough. I’m not sure when it happened, but the feeling started small, and continued to nag and gnaw at me, slowly turning into something a little like unhappiness. Change has often been something I’ve tried to avoid. It has always scared me. My Nana passing away was something I dreaded from a very young age, because I understood death. I couldn’t imagine life without her, and when it finally did happen – I had no choice but to keep going. Getting married was a change I embraced – and having children will be another, if we’re able to get so lucky. And then…I did. I did that crazy thing that us millennials or xennials or whatever label we’re given do: I left a job that made me unhappy to do something that does the opposite. To flex my creativity and my independence, much to the chagrin of just about everyone I know. It’s only been a few months, and I still have a hard time answering people when they ask me what I do for a living now. Freelancer? Photographer? Publisher? I’m finally doing the things I’ve been wanting to do for years. The things I didn’t know I wanted to be doing. In a cocktail shaker, muddle cherries, sugar, and lime juice to mostly a pulp. Add tequila, raspberry liqueur, and 1/4 cup ice. Shake vigorously for 30 seconds. 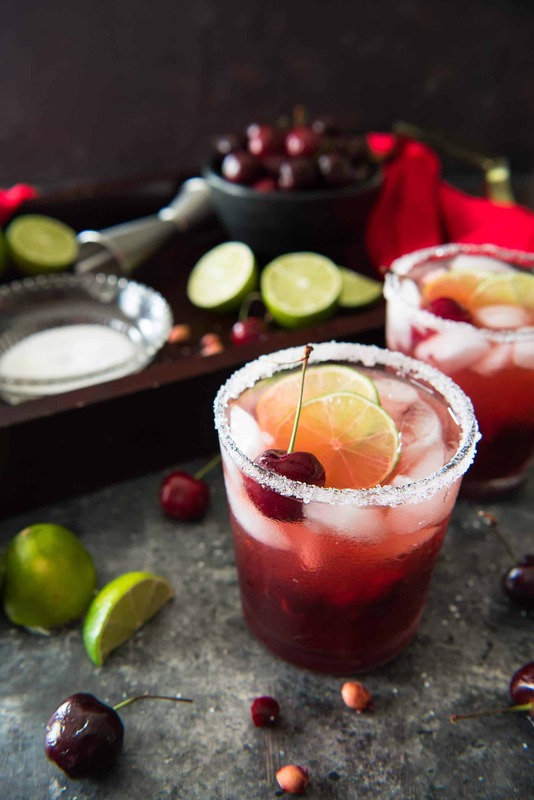 Strain into 2 ice-filled glasses rimmed with salt, adding some of the muddled cherries to the glass as well. Garnish with a fresh cherry or two and a slice of lime. Check out these DEEEEELISH Summer cocktails from some of my friends! I cannot wait to try this one! Haven’t had a cherry margarita before! Looks stunning! What an unusual margarita but SO pretty! My story is similar but includes a divorce after a 30 year marriage and a foray into business after being a stay at home mom. Being content is not enough for sure! Congrats on taking the step! I’m so happy that your journey has brought you to a really good place! Congratulations on making the hard decision to make a change. P.S. This margarita looks fabulous! I’m happy that you’re happy 🙂 Good for you for going for it and even better that it’s working out. These margaritas look fab. I love cassis with all the rich currant flavors. I’ve been drooling over cherries at the grocery store. Now I have a reason to buy them! Looks DIVINE! 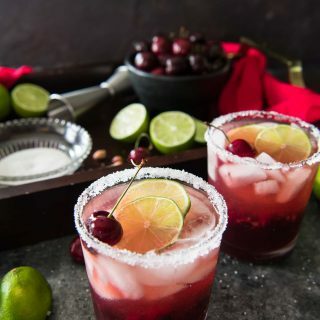 Margaritas and cherries are two of my favorite things! This sounds so good! 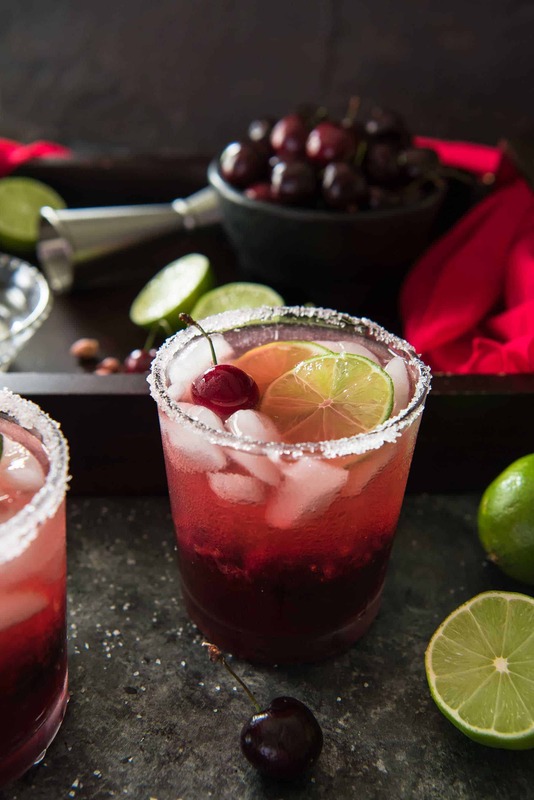 I’m obsessed with cherries and margaritas are my favorite cocktail – so I’m on board. 28 years ago I left a boring but well paying corporate job to go to pastry school. This year I closed a successful custom cake business to blog full time. Both times people thought I was crazy. I’ve not regretted either choice. Glad you’re enjoying your new role. I love this post. A: the recipe of course is drool-worthy, and B: The job change…but you left me hanging! Is it that you are doing your blog full time?If so,congratulations! That is awesome and I agreed very creative and fun. I am mid-stream in job change myself and searching…I am taking some mental notes on your brave journey! Good luck to you! 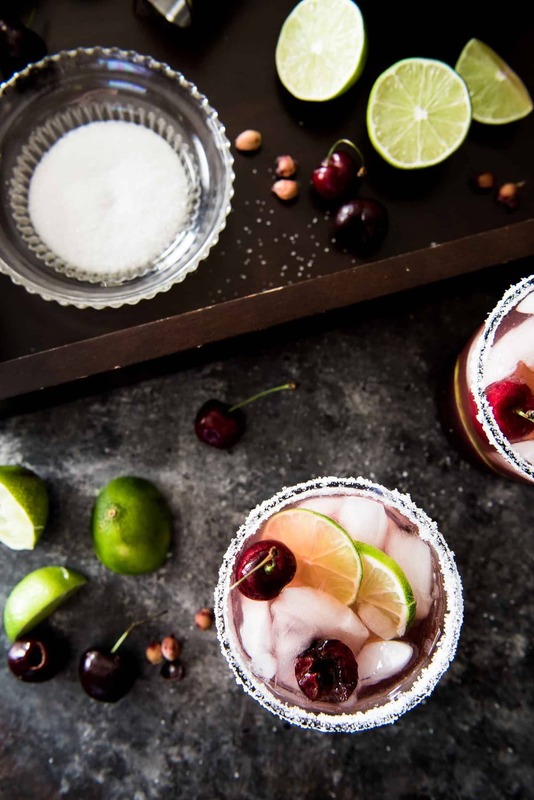 Love these photos, and love fresh cherry margaritas. Great recipe for Taco Tuesday!